Crude Technical outlook - reversal possible in coming days ? You are here: Home / Commodities / Crude Technical outlook – reversal possible in coming days ? Crude Technical outlook – reversal possible in coming days ? 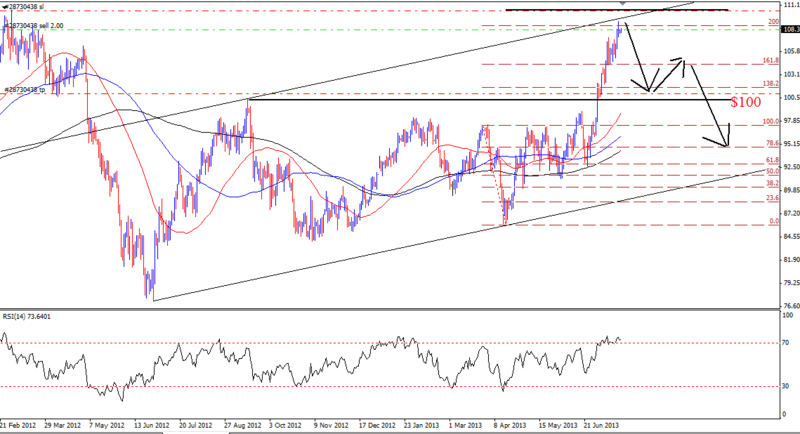 Crude oil‘s rally continued last week and reached as high as 109.32 dollar/barrel. Crude given a long bull run in new financial year. Now its time to review at reversal possibilities. As we can see on charts crude fired from lower level & now reaching to the topline of current ascending channel around $110.50. This area also represent a parallel resistance which is in combination of 200% feb correction level. Thus the combination of many hurdles & over bought indicators we may witness a profit booking season from these levels. Based on above studies, we will prefer to sell crude & will be looking for some possible targets around $100 & lower. $106 could be little stopper for the above. Four Visible Technical Signs that Crude Bottomed Out Here are the 4 visible signs (Volatility Sentiment, Magazine Indicator, COT Percentile , Gold Oil Ratio) we look into it to predict the possible bottom in Crude. Daily Commodity Technical Analysis Overview – 3rd Nov 2014 Gold consolidating after sharp fall & trying to retest the broken support level turned into resistance. WE may witness more weakness as far as $1182 area remains as EOD resistance. Mantra commodity is an analyst group involved in technical analysis of all major commodities gold, silver, crude, copper, natural gas etc. Crude fall more than $4 from the mention resistance area. Awaiting for the projected levels. Crude almost reach to tgt area, kissed $102 mark yesterday. Hopefully the fall will come continue for mention tgt area.